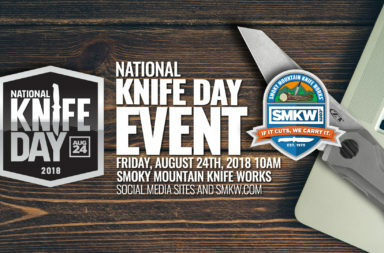 We got an insider tip from Smoky Mountain Knife Works we just couldn’t wait to tell you about. 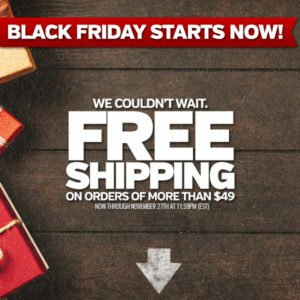 The SMKW Black Friday and Cyber Monday sale this year is a fantastic tiered system. 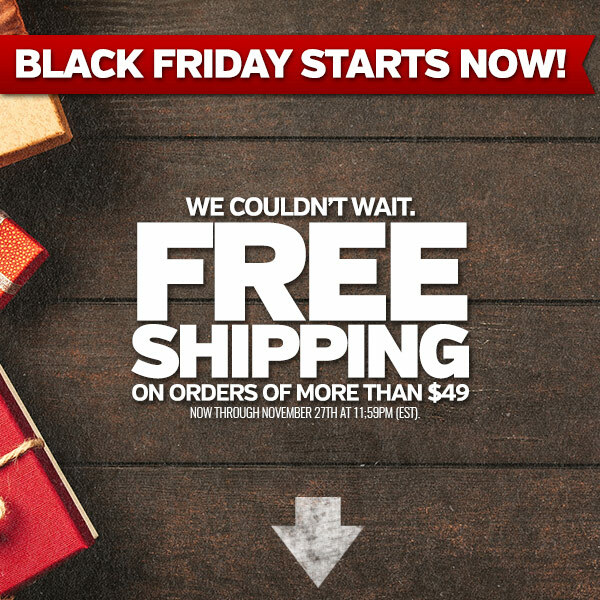 It starts with free shipping and offers rewards for reaching the next tier. The more you spend, the more awesome free stuff you get. They’ve also given you not just a day or two to take advantage of this deal. It will run for more than a full week. It starts November 19th and ends on November 27th. First, and perhaps most excitingly, SMKW is offering free shipping on all orders over $49. 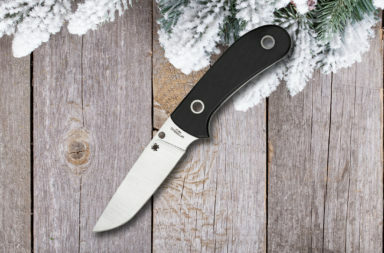 Regardless of the price of the knife, if your total order is greater than $49, shipping is free. Maybe you’ve seen the #livesharp flight tag or stickers in various pocket dumps on the internet. Well, if you spend greater than $75.00, you get free shipping and a free swag bag. Inside that swag bag is a ton of SMKW branded items like the flight tag, an SMKW deck of cards, a cleaning cloth, and a “Smoky Bucks” coupon that’s worth $5 off your next purchase over $50 if you place your order between 11/28/18 and 12/31/18. 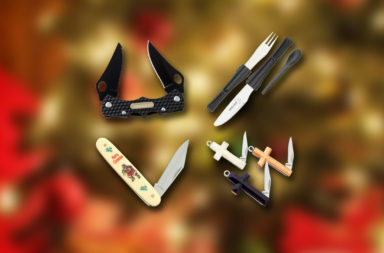 If you spend at least $125 you get free shipping, a swag bag with Smoky Bucks, and a Gerber Pocket Sharpener. This small sharpener is perfect small enough to fit in almost any gear. It has recessed fine and coarse ceramic rods housed in a hard-plastic case. 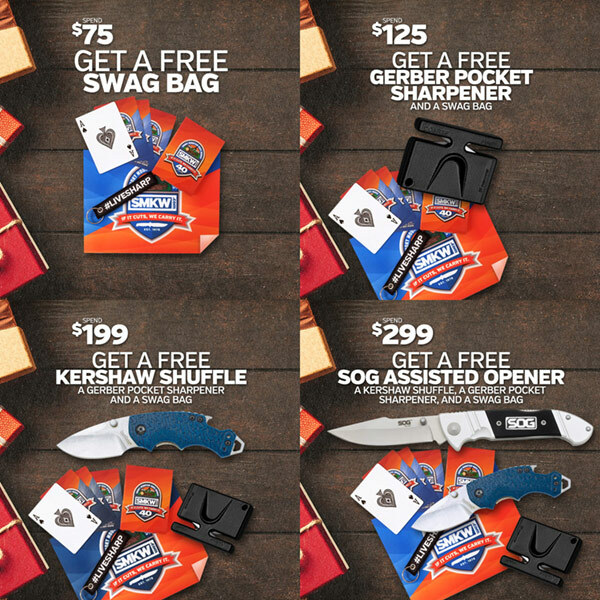 For spending $199 or more, it’s free shipping, a swag bag, a Gerber Pocket Sharpener, and a free Kershaw Shuffle with the blue K-Texture grip. The Shuffle is fantastic for the holiday season. It’s light weight, attaches to your keys, a perfect package opener and once you’re done with holiday gift opening it has a bottle opener to pop the top on a cold one. 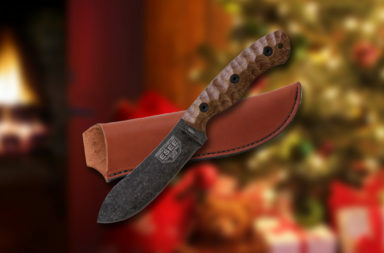 Every order over $299 comes with free shipping, a swag bag with Smoky Bucks, a free Gerber Pocket Sharpener, a free Kershaw Shuffle with the blue K-Texture grip, and a free SOG Assisted Opening Fielder with a G-10 handle. The SMKW Black Friday and Cyber Monday sale is a great deal, a fantastic sale, and includes a ton of value. Make sure you take advantage of this amazing sale from November 19th through November 27th.